If you have watched my previous videos, you should be already aware of my funding experts academy and its main engine the Funding Expert Transformation Tree (FETT) System that conglomerates 17 years of experience in funding, proposal evaluations since 2003 on behalf of the European Commission, input from personal interviews with successful proposal writers and 7 years of training experience. One of the main branches from the FETT system is the C.R.I.T.E.R.I.A. formulaTM that allows you to master a specific methodology and exploit a set of practices for convincing your potential funders on the excellence, impact, and implementation strategy of your proposal. 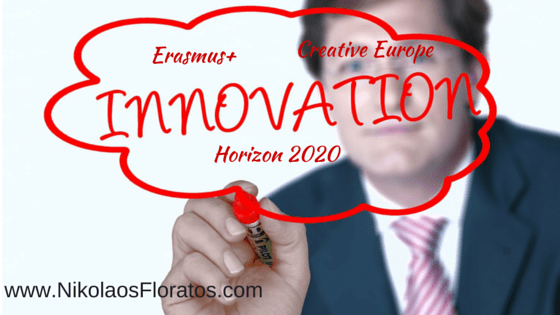 From the formula, I am going to talk briefly on the first I. and that is Innovation and how we can address Innovation in our proposal requesting funding from various programmes such as Horizon 2020, Erasmus+, Creative Europe, etc. Search in compendia (i.e. official summaries of previously funded projects that are provided in pdf publications or in online databases – see e.g. Cordis for Horizon 2020) and with the appropriate filtering and search keywords identify the most related projects that have already been funded and position your project (identify their main scope, achievements and most importantly their current limitations) and highlight that your project will address those limitations. Search in research papers and scientific publication databases and with the appropriate filtering and search keywords position your project accordingly. Normally, universities have access through their library to such online databases that you can access either full articles or their abstract as well as citations for academic journal articles. You need to use them. I am quite fortunate as a PhD researcher to have access to such knowledge database and its value is priceless. Alternatively and if you don’t have access to those resources, you should use Google Scholar, Research Gate and Academia that do not require paid subscription. As soon as you identify related research and scientific papers, you should focus mainly your analysis on the limitations and future research. suggestions of these research activities that are normally mentioned at the end of the paper. You may find the list of such databases at wikipedia. Search for services and products that exist already in the market and they are related to your project innovations. Identify how your expected project innovations position themselves, e.g. by complimenting, substituting, improving, outperforming existing products and services. Google search in looking particularly for pdf documents as well look on industry magazines could be helpful. Furthermore, it may be worth starting with google books search facility (check books.google.com). Use Niche Search Engines: Many people use Google as a starting point of filling up sections in their proposal but this is really not a good practice at all since your proposal lacks consistency and it looks more like a patchwork. On the other hand, you can use specialised search engines, such as Topsy and BuzzSumo that identify popular stories around a given topic and get inspired from them. Also please post a comment and tell me what you think of my article and feel free to ask any questions. I will be answering questions and reviewing comments personally. So that’s it. I hope you find it useful and you can apply it to your particular situation for successful exploitation of European Funding. ← Innovators are made and not born! Learn How!